Want to know how much would a social pension cost in your country? Check it out! HelpAge International* has developed a pensions calculator to work out the cost of universal pensions in 175 countries across the globe. Pick a country, age of eligibility, benefit level and discover how much this would cost! 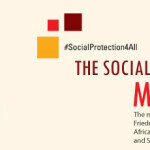 *HelpAge International is member of the Global Coalition for Social Protection Floors.